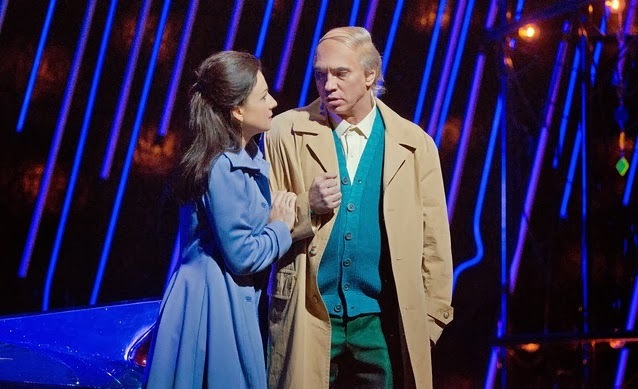 Superconductor recalls the best opera performances of 2013. 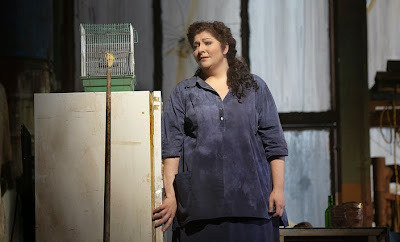 A bird in a gilded cage: Christine Goerke in Die Frau ohne Schatten at the Met. As the year is ending we are finally getting to our end-of-2013 wrapup. This was supposed be to be a Top Ten list but I think it's going to be a lucky thirteen--it was a pretty good year for opera! Here are the best opera performances (and operas in concert) that I saw this year in chronological order. All links lead to the full reviews. James Levine conducts Mahler's Symphony No. 7. 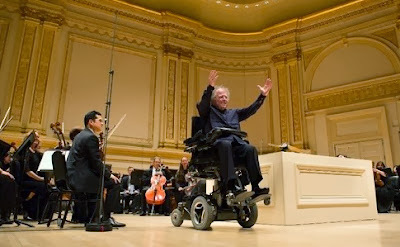 James Levine, triumphant, rolls onto the stage of Carnegie Hall. Photo by Marty Sohl © 2013 The Metropolitan Opera/The MET Orchestra. The symphonies of Gustav Mahler are marathon works, an important test for any conductor eager to show his command of complex orchestration and vast marching forces of sound. On Sunday afternoon at Carnegie Hall, Metropolitan Opera music director James Levine gave his first Mahler performance since his two-year absence from conducting duties. The program: the orchestral Songs of a Wayfarer and the Symphony No. 7, the most mysterious and misunderstood work of the composer's catalogue. Superconductor lists The Worst of 2013. 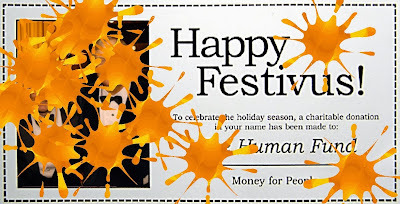 This year's gala for The Human Fund has been cancelled due to flying eggs. This is the first installment in the blog's year-end wrap-up designed to keep you all entertained and well-read as you're stuffing yourselves at your Yuletide parties. As we do every year at Festivus, it's time to air the grievances. Superconductor lists the crappiest things to happen in the year of 2013. From the unnecessary death of the New York City Opera to the orphan status of one of New York's most important orchestras, it's all here. There's probably more to add to this list, but that thought is just too depressing. 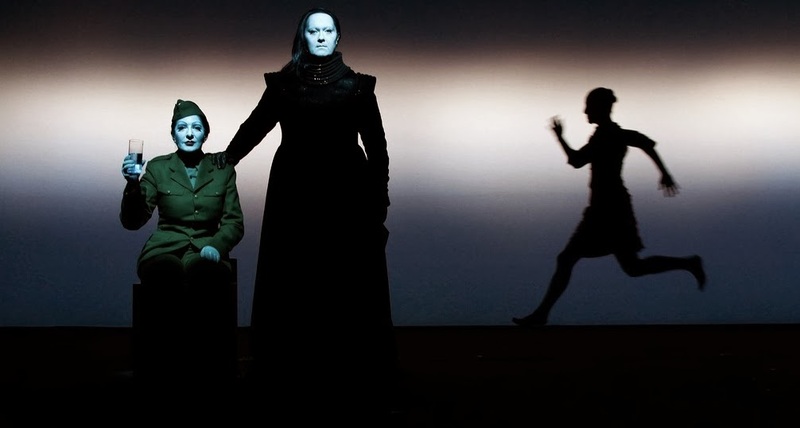 Robert Wilson presents The Life and Death of Marina Abramović. Marina Abramović sits. Antony sings (eventually) in The Life and Death of Marina Abramović. Photo by Lucie Jansch for DeSingel © 2013 Robert Wilson/Watermill Institute. The director Robert Wilson is known for his signature style: dark costumes, white Kabuki makeup and stylized movements in front of moving bars of light. Last night at the Park Avenue Armory, Mr. Wilson's style was placed in service of another uncompromising figure: performance artist Marina Abramović. Tuesday night was the second of a series of New York performances of The Life and Death of Marina Abramović, the collaboration between these two artists which premiered in Manchester in 2011. The Met presents its "family-friendly" Flute. Twitter feed: Ashley Emerson (left) and Nathan Gunn as Papagena and Papageno in The Magic Flute. 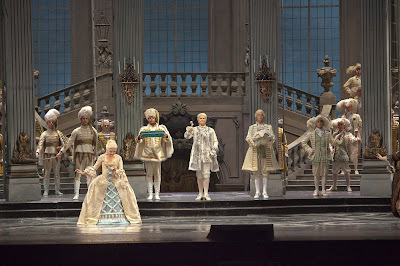 With its mix of popular Viennese music hall song, classical-style arias and spoken dialogue, Mozart's Die Zauberflöte has suffered cuts and alterations ever since the original Papageno (Emanuel Schickenader) pranced upon the stage of the Theater auf der Wieden in 1791. On Monday night, the Metropolitan Opera opened its one-act, 95-minute Flute as this year's holiday offering, geared towards exposing New York's next generation to the magic of Mozart's final opera. The American Symphony Orchestra presents Feuersnot. 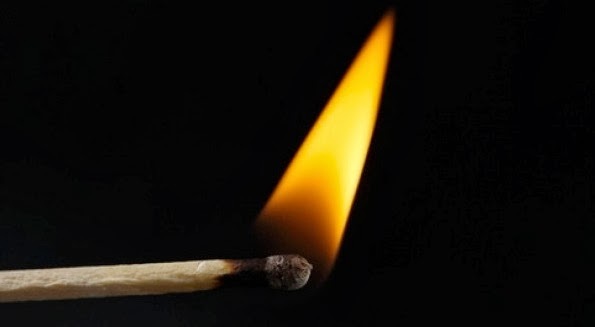 It's either a virgin...or this as Feuersnot by Richard Strauss gets a rare hearing. The early operas of Richard Strauss (that is, the two he wrote before the whirlwind success de scandale of Salome) are incorrectly dismissed as juvenalia. 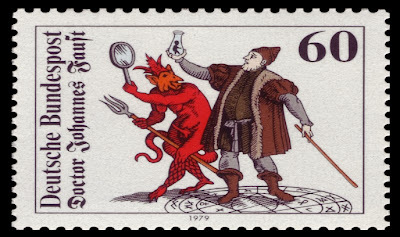 Take Feuersnot the one-act comedy that the composer wrote (right after Ein Heldenleben) as a riposte to his home city of Munich and its notably conservative musical establishment. On Sunday afternoon, New Yorkers were able to judge Feuersnot for themselves, as the opera received a much-neeeded airing from Leon Botstein and the American Symphony Orchestra. 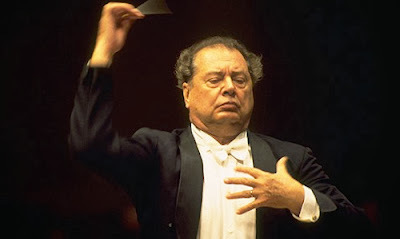 Rafael Frühbeck de Burgos conducts the New York Philharmonic. Photo by Chris Lee © Chris Lee Photography. The return of Rafael Frühbeck de Burgos to the podium at Avery Fisher Hall is an annual tradition at the New York Philharmonic. The Spanish conductor always offers unique interpretations of the repertory in a firmly conservative style, beloved by the orchestra's subscriber base. This week's concert program featuring the music of Beethoven and Richard Strauss was also part of the season-long valediction for concertmaster Glenn Dicterow, who is wrapping up his three decades in the position. Friday's afternoon audience, more conservative than most, were thrilled at the prospect of two works written in firm tonal language. Mr. Fruhbeck elected to open the concert with Beethoven's Eighth Symphony, the shortest and most quicksilver of the composer's nine. From the downward slash of the opening chords, this was an unabashedly Romantic performance. Mr. Frühbeck chose a slightly larger orchestra, giving the dance rhythms an unusually thick texture. This was most apparent in the Allegretto. First violinist (Sheryl Staples) set the metronome pace at quick but moderate, not the pell-mell playing that has become popular among more modern Beethovenians. The Mother of Us All at Manhattan School of Music. 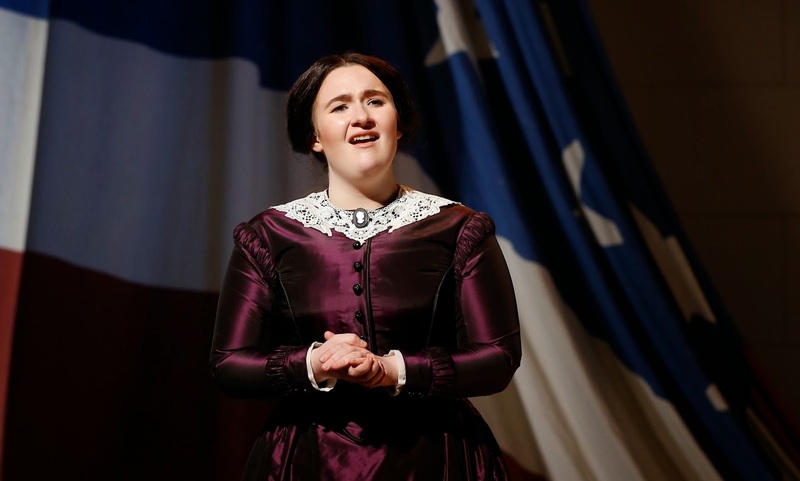 History lesson: Noragh Devlin as Susan B. Anthony in the MSM production of The Mother of Us All. Photo by Carol Rosegg © 2013 Manhattan School of Music. Ever since Monteverdi's L'Incoronazione di Poppea, the portrayal of historic figures has been central to the genre of opera. And no other opera packs in more history than The Mother Of Us All, the second collaboration between composer Virgil Thomson and the poet Gertrude Stein. That opera, which premiered in 1947 at Columbia University returned to Morningside Heights on Wednesday night. 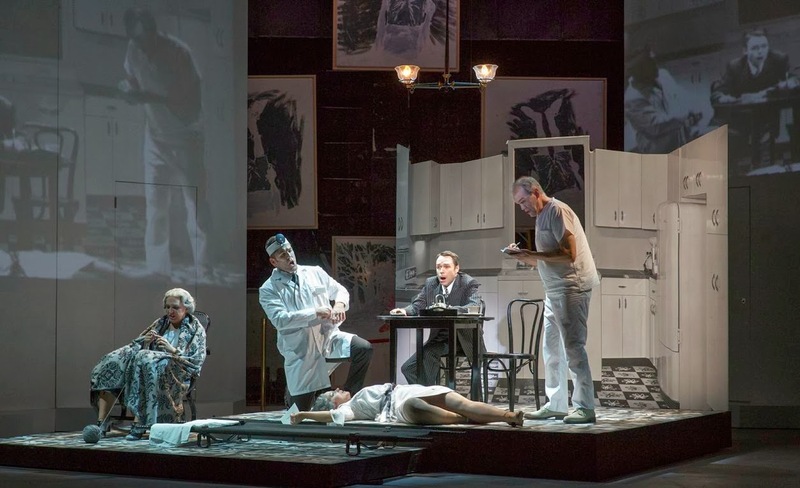 This new production at the Manhattan School of Music told the story effectively, but felt a bit fusty, like a school trip to a long-lost wing of the Smithsonian Institution. The Orchestra of St. Luke's celebrates André Mathieu. The young master: André Mathieu at the Steinway. 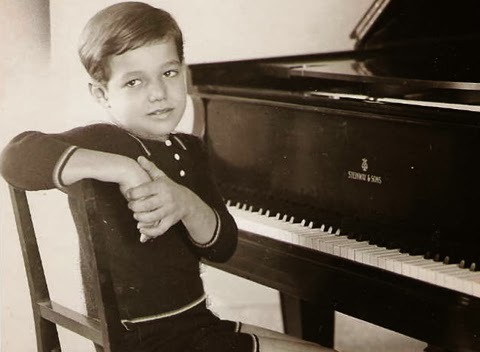 Child prodigies populate the history of classical music. From the early works of Mozart to the precocious teenage operas of Erich Wolfgang Korngold, the names are legendary, and have become part of the genre's mythology. On Tuesday night, the Orchestra of St. Luke's and pianist Alain Lefèvre shed light on another prodigy: the Canadian composer André Mathieu. The occasion: a concert at Carnegie Hall, under the baton of Buffalo Philharmonic music director JoAnn Falletta. 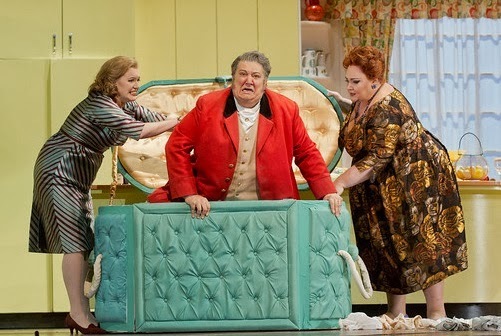 The Met unveils Robert Carsen's Falstaff. Hampered: Falstaff (Ambrogio Maestri, center) seeks an exit in Act II of Verdi's comedy. Falstaff is unique. Verdi's last opera (and his lone successful comedy) arrived when the composer was 79 and still in full command of his powers. 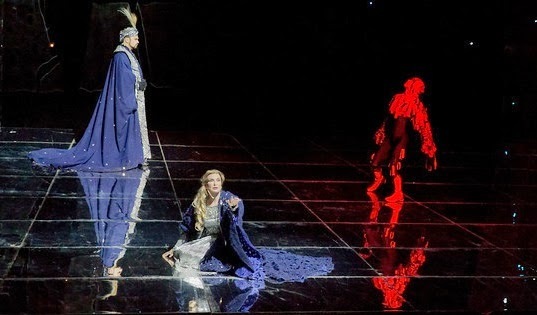 Yet despite its tunefulness, the score lacks the "big numbers" of Rigoletto, Aida and Otello, choosing to present the comedy as a complex dialogue between singers and orchestra. As a result, Falstaff, though a respected opera is considered an opera for connoisseurs, and appears only occasionally on the operatic stage. The Orpheus Chamber Orchestra at Carnegie Hall. 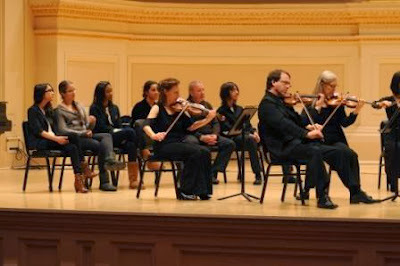 Members of the Orpheus Chamber Orchestra onstage at Carnegie Hall. Image © 2013 the Orpheus Chamber Orchestra. The Orpheus Chamber Orchestra is one of this city's most enduring classical music institutions: a democratically organized collective of players who play four shows a year at Carnegie Hall. There is no music director. There isn't even a concertmaster. The players rotate the first chair of the violin section, the player whose bow movements provides the beat for most performances. And yet, despite their recorded legacy and reputation, this writer had never seen the ensemble play. Michael Tilson-Thomas conducts the Philadelphia Orchestra. Michael Tilson Thomas. Photograph by Eric Thayer © National Public Radio. A valued voice is silenced too soon. 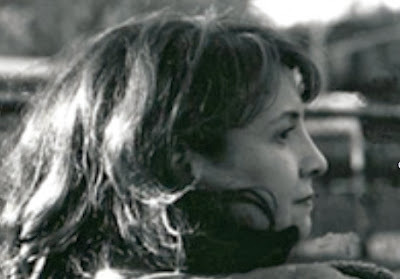 Marion Lignana Rosenberg. Photo by Meaghan Donahue. The entire New York classical music community is mourning the loss of Marion Lignana Rosenberg, who passed away over Thanksgiving weekend while in Albany visiting friends for the holiday. It was reported that the cause of death was a pulmonary embolism. She was 51. The Met's second cast takes over Eugene Onegin. Marina Poplavskaya takes over in the Met's new production of Eugene Onegin. It is sometimes instructive to see the second cast. That maxim applies to the mid-season return of Deborah Warner and Fiona Shaw's new Eugene Onegin at the Metropolitan Opera. The revival opened last week. On Monday night, the cast: baritone Peter Mattei (Onegin) soprano Marina Poplavskaya (Tatiana) and tenor Rolando Villazón (Lenski) gave their third performance together. They brought fresh energy and perspective to this production, which opened the Met's season in September of this year. 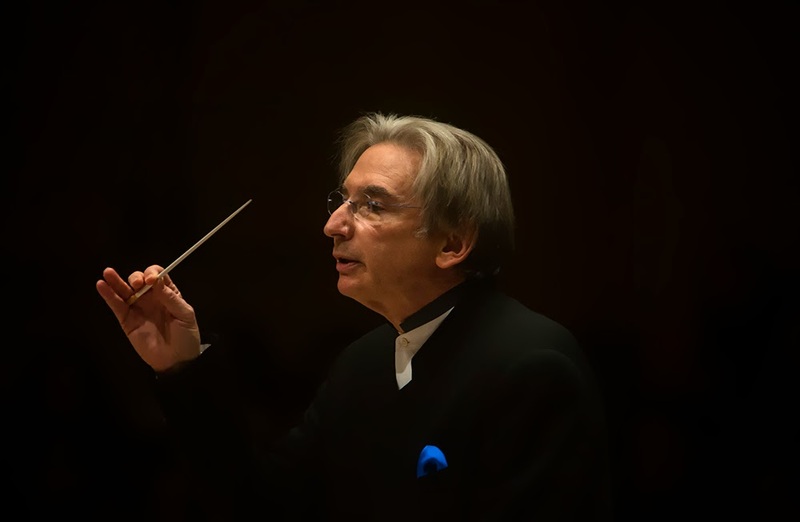 Michael Tilson Thomas to step in with the Philadelphia Orchestra. This is in no way an endorsement of any expectorant. 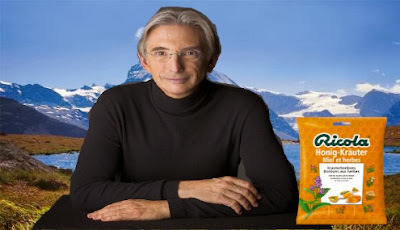 Image of Michael Tilson Thomas from the conductor's official website. Ricola cough drops and Swiss background from the official Ricola website. In a late-breaking story, the Philadelphia Orchestra's Friday night Carnegie Hall concert has had a change of conductor and program. Yannick Nézet-Séguin has a sinus infection and will not conduct this week. 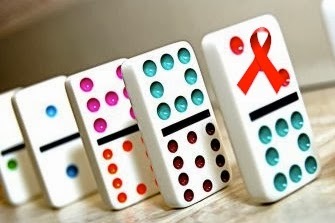 A Reflection on World AIDS Day. Today is World AIDS Day, and Superconductor woud like to take a moment to reflect on the death of Christopher Keene, and its ultimate effect: the 2013 demise of the New York City Opera. For six years, Mr. Keene was at the helm of New York City Opera, steering that company into the 1990s with productions of classic operas and rarities like Zimmerman's Die Soldaten, Schoenberg's Moses und Aron and Hindemith's Mathis der Maler. Following in the footsteps of the last general manager Beverly Sills, Mr. Keene was tabbed as the man who would ensure a long future for Lincoln Center's 'other' opera company into the next century on beyond. 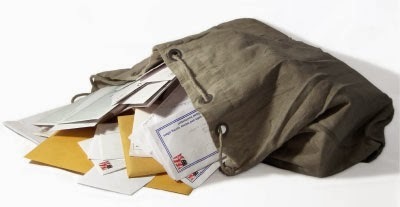 Yes I actually answer reader mail. Send me some at ppelkonen@gmail.com. I have seen you at many concerts and I would not truthfully say that you sit in the CHEAP seats. Would you??? I enjoy your blog but PLEASE replace your motto. The Boston Symphony Orchestra serves up Beethoven and Brahms. Door busters: Rafael Frühbeck de Burgos (left) and Peter Serkin serve up Beethoven and Brahms. 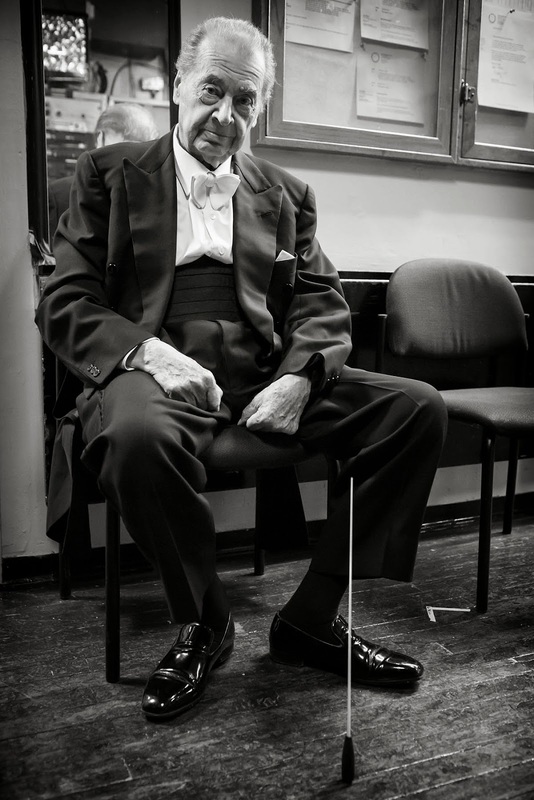 Photo by Sam Brewer © 2013 Boston Symphony Orchestra. Black Friday is a weird tradition. Since the 1960s, American consumers gathered at the malls and "big box" stores on the day after Thanksgiving for so-called "door-buster" deals. All this consumerism an have injurious, or even fatal consequences. But for the Boston Symphony Orchestra and its audience, today was just another Friday matinee at Symphony Hall, a civilized pause for high culture in the middle of all the holiday hype. The program for this week's concert featured a crowd-pleasing pairing of Brahms (the Piano Concerto No. 2 with soloist Peter Serkin) and the Beethoven Seventh Symphony. With the sturdy conductor Rafael Frühbeck de Burgos on the podium, this looked to be safe serving of holiday fare, sure to please the musically conservative audiences that attend the BSO's Friday concerts. Verdi has the last laugh in this new production. Des McAnuff production, coming to the Met on Nov. 6. Photo by Catherine Ashmore © 2012 The Royal Opera House at Covent Garden. For most of his long career Giuseppe Verdi was known for writing tragedies, from the family drama of his first opera Oberto to his masterpiece Otello. 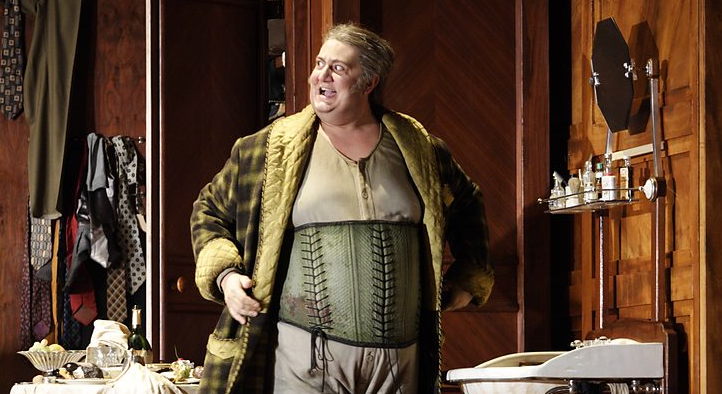 For his final opera and last musical utterance, he finally turned to comedy. Working with librettist Arrigo Boito (his collaborator on Otello), he created Falstaff from the Shakespeare play The Merry Wives of Windsor. Some holiday thoughts from Superconductor. Milhouse and Lisa Simpson meet Tom Turkey on The Simpsons. 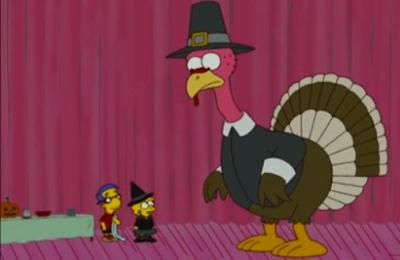 Image from Treehouse of Horror XIX, © 2008 Gracie Films/20th Century Fox. It's Thanksgiving here and I thought it might to be time to stop in the middle of hurried holiday travel packing (we're going to Connecticut and to Friday's concert at Boston's Symphony Hall) and give thanks. Thank you for reading this blog. And if you've been here for all of its nearly seven years offering classical music and opera coverage and criticism, thank you. Fresh blood revives Der Rosenkavalier at the Met. (Alice Coote) in Act II of Der Rosenkavalier. Photo by Cory Weaver © 2013 The Metropolitan Opera. Peter Grimes marks the Britten centennial at Carnegie Hall. 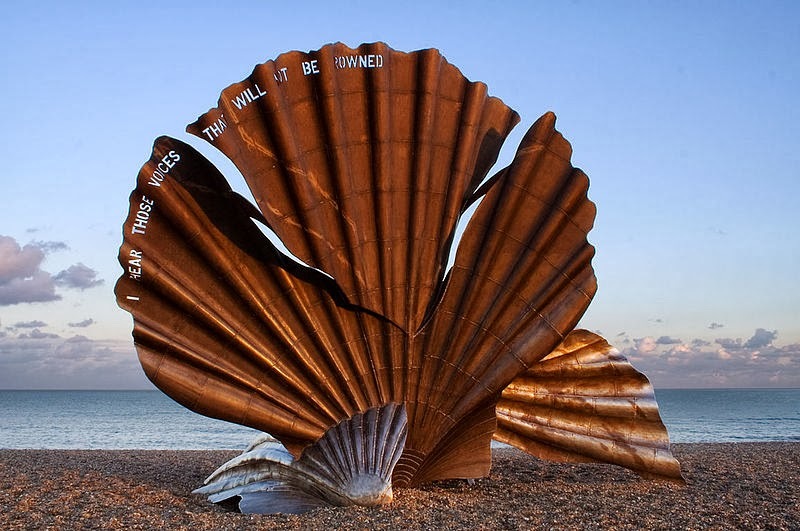 The Scallop, sculpture dedicated to Benjamin Britten, sits on the beach in his hometown of Aldeburgh. 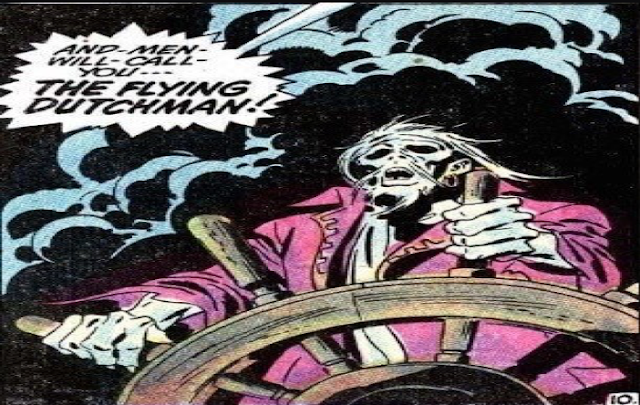 The inscription "I hear those voices, they will not be drowned" is from the libretto of Peter Grimes. Sculpture by Maggi Hamblin © 2003 the artist. Photo under license from Wikimedia Commons. Benjamin Britten's 1945 opera Peter Grimes remains the most enduring of the composer's stage works. One of the few major works from the mid-20th century that has a secure place in the international operatic repertory, it was the ideal choice for a celebration of the composer's 100th birthday on Friday night at Carnegie Hall. And there was no better choice for this tale of an individual against the oppression of a community than the St. Louis Symphony, here under the baton of its music director David Robertson. The New York Philharmonic celebrates Benjamin Britten. 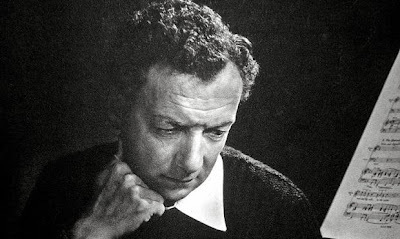 Benjamin Britten. Photo by Yousuf Karsh © Wikimedia Commons. Today is the name day of St. Cecilia, patron saint of musicians. It's also the 100th birthday of British composer Benjamin Britten. To commemorate the latter occasion, the New York Philharmonic scheduled three performances of the composer's lesser known works this week: the Serenade for Tenor, Horn and Strings and the Spring Symphony. The performances were intended to provide a showcase for Paul Appleby, who would sing the tenor parts in each piece. The Juilliard School presents Handel's Radamisto. 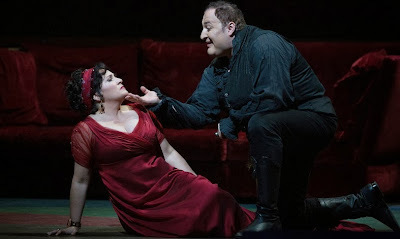 Radamisto (John Holiday) consoles Zenobia (Virginie Verrez) in a scene from Handel's Radamisto. Photo by Nan Melville © 2013 The Juilliard School. The Juilliard Opera is more than just a student ensemble--this is one of the most innovative companies at Lincoln Center. Each season, the students and guest artists at the Peter Jay Sharp Theater find ways to present a vast and diverse repertory. On Wednesday night, Juilliard opened its 2013 opera season with a new production of Handel's Radamisto by James Darrah. The performances, featuring the school period ensemble Juilliard 415, marked the conservatory debut of conductor Julian Wachner. Strauss and Rouse at the New York Philharmonic. 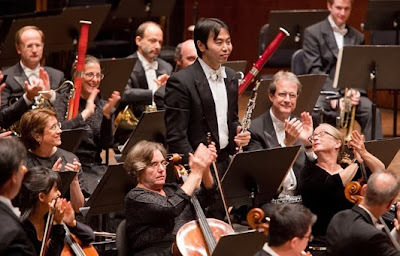 New York Philharmonic oboist Liang Wang gets a round of applause from his colleagues. Photo by Chris Lee © 2009 The New York Philharmonic. Late casting change in Der Rosenkavalier. "The Presentation of the Rose" from Act II of Der Rosenkavalier. Photo © 2009 The Metropolitan Opera. 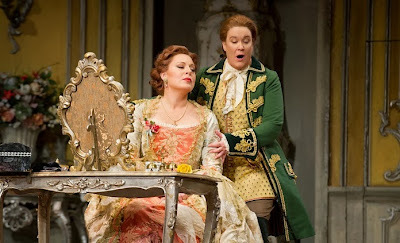 In a late breaking item (courtesy of Lisa Hirsch at The Iron Tongue of Midnight) soprano Erin Morley will take over as Sophie in the Metropolitan Opera's 2013 revival of Der Rosenkavalier. The Richard Strauss comedy, one of the composer's most beloved comic creations, opens Friday at the Metropolitan Opera House. 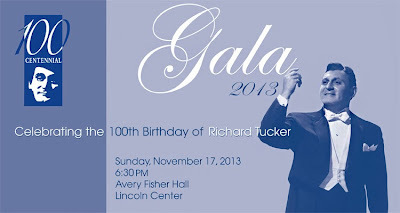 The 2013 Richard Tucker Gala at Lincoln Center. This year's Richard Tucker Gala celebrates the singer's 100th birthday. The annual Richard Tucker Gala is like opera's equivalent of the All-Star Game, a chance to hear today's foremost opera singers alongside the stars of tomorrow. Held to commemorate the Richard Tucker Foundation's annual awarding of the Tucker Prize to a promising young singer, this concert at Lincoln Center attracts affluent opera lovers and industry cognoscenti alike. This year's gala also celebrated the centennial of Richard Tucker's birth, and featured a new banner across the back of the stage with five portraits of the late tenor and New York native. The American Symphony Orchestra pays tribute to Elliott Carter. 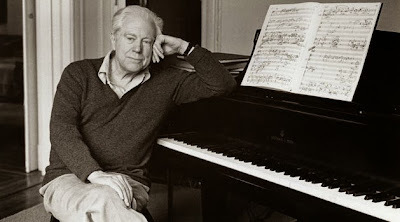 The composer Elliott Carter in his New York apartment in 1983. Photo by Nancy Crampton courtesy Boosey & Hawkes. New York's own Elliott Carter was the dean of modern music in this country, an artist whose vast output spanned orchestral works, songs and even opera. His music always looked relentlessly forward, breaking new ground even in his last works. On Sunday afternoon at Carnegie Hall Leon Botstein and the American Symphony Orchestra celebrated the memory of this great composer, who died on November 5 of last year at the age of 103. The carefully curated program offered six of Carter's pieces, spanning eight decades of his output and giving a glimpse at the wide variety of styles and music created over a long compositional career. The last run for the Met's classic 1967 production of the Strauss comedy. 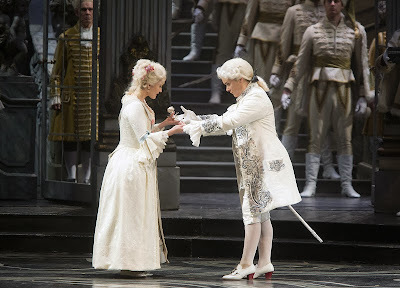 Marina Serafin and Alice Coote in a tender moment from Act I of Der Rosenkavalier. 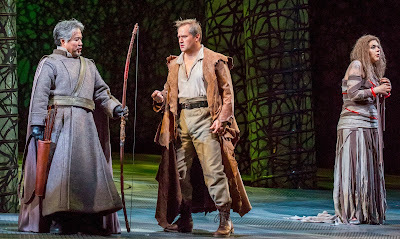 Photo by Jonathan Tischler © 2013 The Metropolitan Opera. 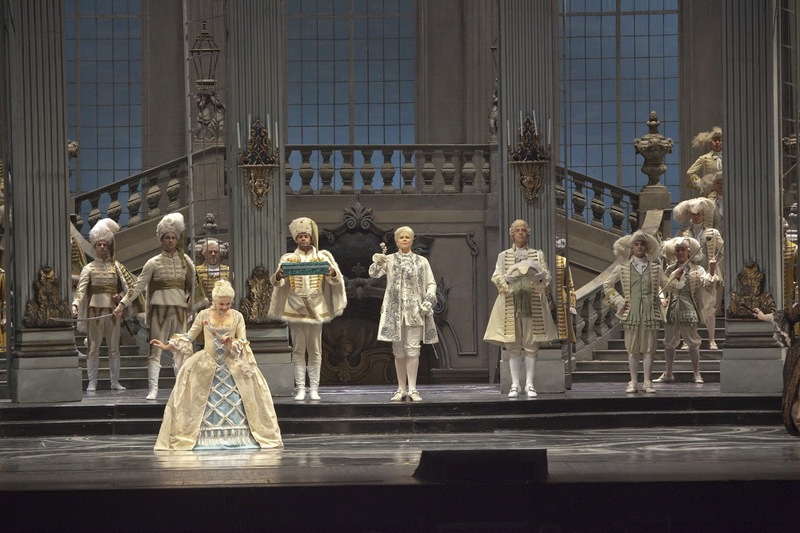 Der Rosenkavalier is a rambunctious Viennese comedy, a bitter-sweet coming of age story that chronicles Octavian's transition from a sweet, adulterous relationship with the Marschallin (Marina Serafin) to eventual marriage to Sophie von Faninal, a 15-year-old ingenue played by Erin Morley. (She is a late replacement for Mojca Erdmann, who is recovering from pneumonia.) Edward Gardner conducts. 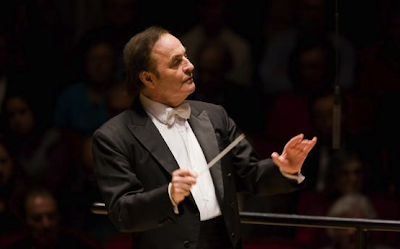 Charles Dutoit conducts the War Requiem at Orchestra Hall. Charles Dutoit. Photo by Chris Lee. On Thursday night, the Chicago Symphony Orchestra marked the 100th birthday of composer Benjamin Britten (coming up on November 22nd) with the first of three performances of his War Requiem. This massive work, requiring two seperate orchestras, chorus, children's choir and three soloists, was conducted by Charles Dutoit, the Swiss maestro whose globe-girdling 2013 conducting schedule has focused on performances of this particular work. Parsifal at Lyric Opera of Chicago. Parsifal, as Kundry (Daveda Karanas) looks off. Photo by Todd Rosenberg © 2013 Lyric Opera of Chicago. The Lyric Opera of Chicago's new production of Parsifal (by director John Caird, making his house debut) is at once modern and old-fashioned, re-imagining Wagner's medieval iconography (Spear, Grail, magic garden) in a way that makes sense to a modern audience and still respects the rich stage history of this opera at Bayreuth and elsewhere. 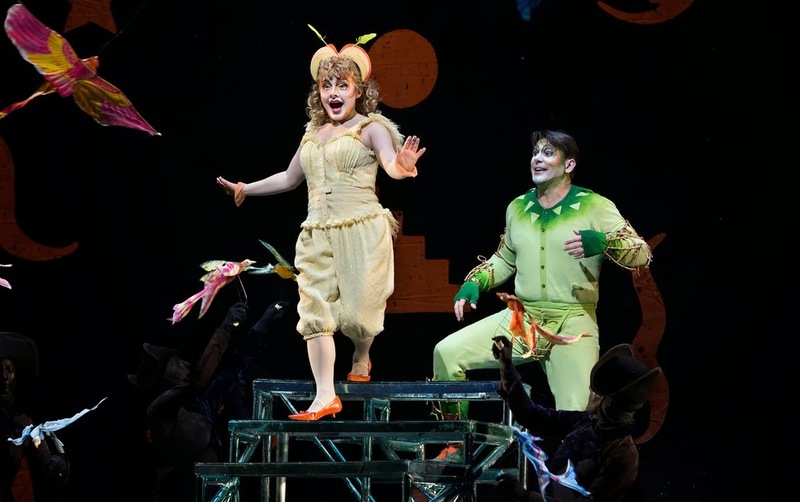 Mr. Caird's production uses six principal dancers (the choreographer is Tim Claydon) to create a vision of flying swans, woodland creatures (Kundry arrives by anthropomorphic horseback) and more movement than one usually sees in this static opera. The results are emotionally satisfying and magical, and familiar enough to please even the most conservative Wagnerite. The Met revives its "Las Vegas" Rigoletto. 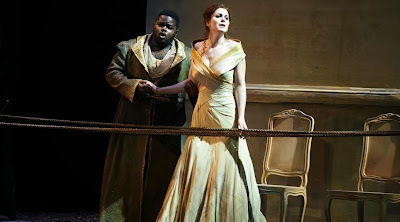 Gilda (Irina Lungu) in the Met's revival of Rigoletto. Despite a run of strong performances last season and a wave of critical acclaim, the Metropolitan Opera's still-new Michael Mayer production of Rigoletto remains controversial. Mr. Mayer's production updates Verdi's opera to 1960s Las Vegas, transforming the Duke into a Frank Sinatra-type casino entertainer and the titular hunchbacked jester as his opening act: a painfully unfunny insult comic. The Estonian National Symphonic Orchestra at Lincoln Center. 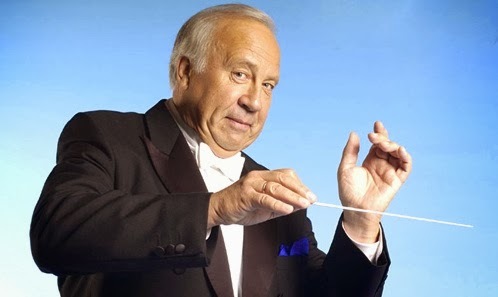 Forever young: conductor Neeme Järvi. Estonian conductor Neeme Järvi is of the old school, and not just because the conductor is now 76. On Sunday evening, he brought the Estonian National Symphonic Orchestra and the Estonian Philharmonic Chamber Choir to the White Light Festival at Lincoln Center. Their purpose: a program of Sibelius, Tormis, Mozart and Arvo Pärt at Avery Fisher Hall. Billed as The Word Made Flesh, this concert was part of this year's White Light Festival. The New York Philharmonic offers a new version of Mozart's Requiem. 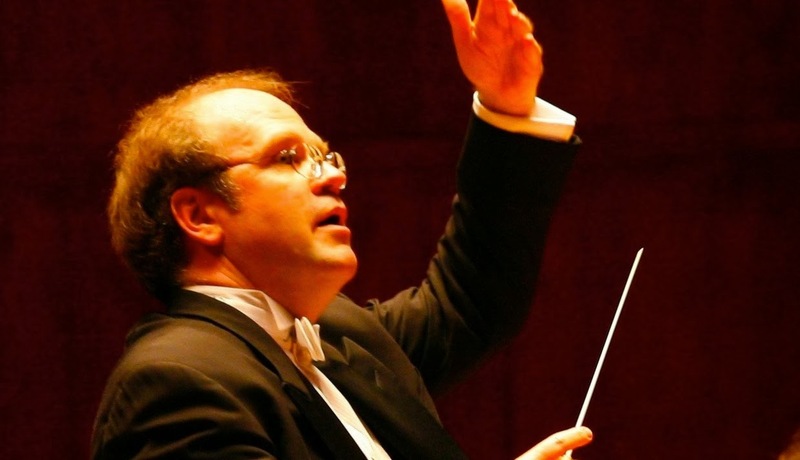 Conductor Bernard Labadie. Photo by David Cannon© 2013 Les Violins du Roy. In March of this year, the New York Philharmonic offered The Bach Variations, an an entire month celebrating the music of Johann Sebastian Bach. Not only did this festival remind concert-goers of this ensemble's skill with baroque music, it also provided opportunity for some lesser-known conductors to appear with the orchestra. One of them was Bernard Labadie, music director of Les Violons du Roy and a specialist in music from the baroque era. On Friday night, he conducted with a brisk, efficient energy, moving lightly on his feet and drawing dulcet tones from singers and ensemble. Eric Owens takes on Mefistofele at Carnegie Hall. Stamping out evil: Mephistopheles (left) and Faust on a 60dm West German postage stamp. On Monday night, the Collegiate Chorale opened their 2013 season at Carnegie Hall with a concert performance of Arrigo Boito's Mefistofele. This was one of the most anticipated evenings of the fall opera season in New York, and marked the first appearance of baritone Eric Owens in the demanding title role. It was also the first performance of Mefistofele in 13 years--the show was last seen at the Metropolitan Opera in 2000 in Robert Carsen's sturdy production. The Cleveland Orchestra returns to Lincoln Center. 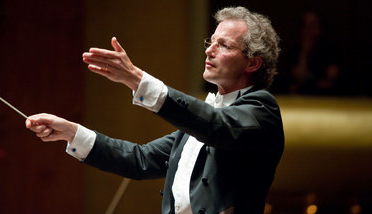 Franz Welser-Möst leads the Cleveland Orchestra at Avery Fisher Hall. Photo by Stephanie Berger for the Cleveland Orchestra © 2008. Franz Welser-Möst and the Cleveland Orchestra have been absent from Lincoln Center since 2008 when they presented a five-day festival pairing the symphonies of Anton Bruckner with music by John Adams. 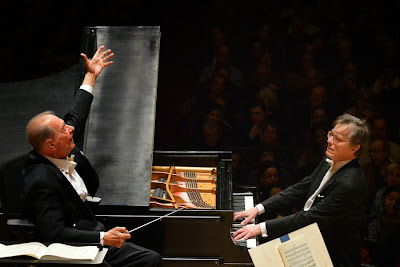 On Monday night, conductor and orchestra returned to Lincoln Center for another combination of classical and modern composers: in this case Ludwig van Beethoven and Olivier Messiaen. This unusual, but effective pairing was a major concert of this year's White Light Festival, the performing arts center's annual Fall exploration of the numinous in the lively arts. 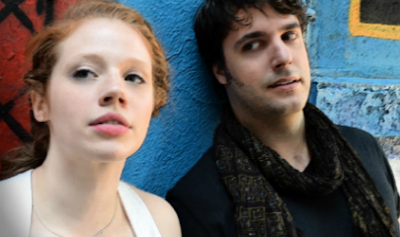 The New York Opera Exchange presents Romeo et Juliette. by Ellen Fishbein, special to Superconductor. Kendra Berentsen (left) and Scott Ingham star in Romeo et Juliette. Photo courtesy New York Opera Exchange. On Sunday evening, the fledgling New York Opera Exchange explored French repertory with a charming production of Romeo et Juliette, the five-act adaptation of Shakespeare's play by composer Charles Gounod. The production was mounted at the Unitarian Church of All Souls on Lexington Avenue. Though beautiful, the space was a risky choice: sound resonated freely in the room, but so did mistakes. A few hiccups in the overture gave way to a consistent performance from the orchestra, which navigated Gounod’s delicate dissonances smoothly under conductor David Liebowitz. Richard Strauss' mighty, mystic morality tale returns. Red Falcon (Scott Nelson) in a moment from Die Frau ohne Schatten. 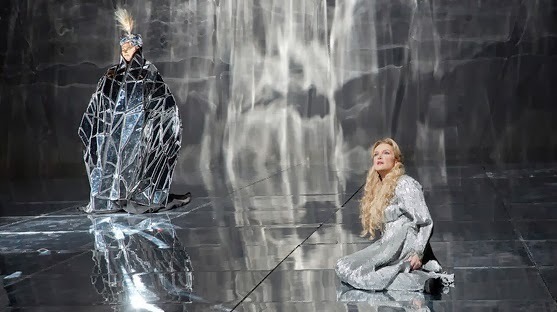 Die Frau ohne Schatten is a beloved Richard Strauss opera, but like a comet, it is only seen occasionally. Constructed on an enormous scale and requiring a huge orchestra, this 1919 work is at once a fairy tale, an ode to domestic harmony and a celebration of the joys of having children. 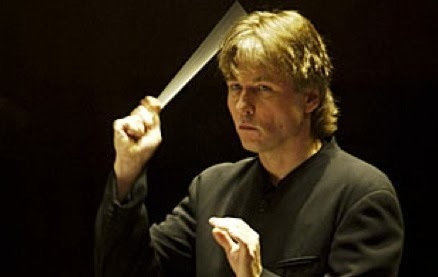 Esa-Pekka Salonen in action. © 2013 The Philharmonia Orchestra. Ever since he stepped in, Bernstein-like to lead the Philharmonia Orchestra in a performance of Mahler's Third Symphony, Esa-Pekka Salonen has led the double existence of composer and conductor. Happily, he has succeeded in both endeavors, leading crisp, hospital-corner performances of orchestral music from the last three centuries, while breaking new musical ground with his own eclectic compositional style. The Met still believes in Luc Bondy's Tosca. the Metropolitan Opera's revival of Puccini's Tosca. With the tedious inevitability of an unloved season, the Metropolitan Opera's current Luc Bondy production of Tosca, received its third revival (in four years) on Tuesday night. This production, which transports Puccini's Roman melodrama into a grim industrial setting better suited to Wozzeck, was roundly booed on opening night in 2009. Despite tweaks, adjustments and (a performance of quality from its leading and supporting cast) it remains a production best seen from the score desks in the Family Circle. Angela Meade takes over the Met's Norma. 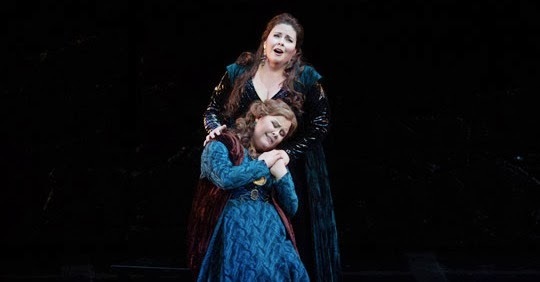 Angela Meade (top) and Jamie Barton share a sisterly moment in Bellini's Norma. Photo © 2013 The Metropolitan Opera. Since the premiere of Bellini's Norma in 1831, the opera's title role has become a career statement for any soprano. Malibran, Callas, Sutherland and Sills have all essayed the part to varying degrees of success. Thanks to Hollywood and the occasional TV commercial "Casta diva" has become one of those melodies known even to those ignorant of the world of opera--the biggest hit tune in Bellini's repertory. Le Concert d’Astrée plays the White Light Festival. 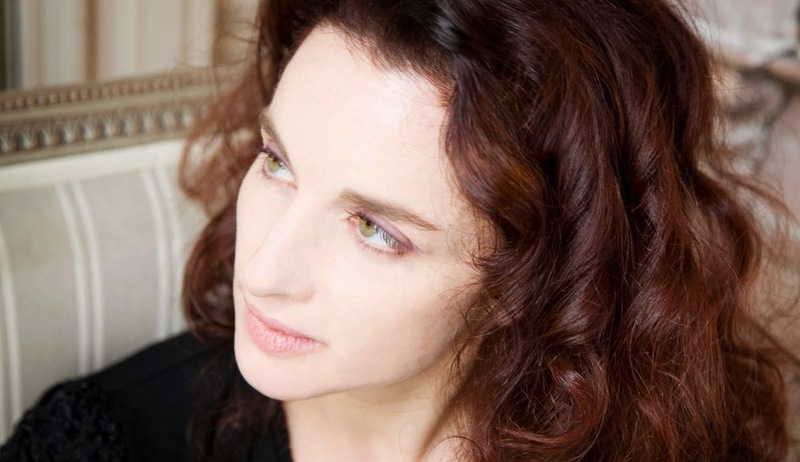 Conductor Emmanuelle Haïm brought Le Concert d'Astrée to this year's White Light Festival. Photo by Simon Fowler © 2013 Virgin Classics courtesy Lincoln Center. George Frederic Handel was one of the most prolific composers of operas and oratorio in the 18th century, creating an enormous amount of material for the human voice. On Saturday night, Lincoln Center hosted one of the composer's rarely heard early works: Aci, Galatea e Polifemo, commissioned in Naples in 1708. The composer was just 22 years old. The work was presented by the French period ensemble Le Concert d'Astrée under the banner Metamorphosis, part of the performing arts organization's fourth annual White Light Festival. The Philadelphia Orchestra indulges its sweet tooth. Rafael Frühbeck de Burgos. Photo by Steven J. Schwartz, courtesy of the Philadelphia Orchestra. Sometimes you just get to see an orchestra do what they do best. On Friday afternoon, the Philadelphia Orchestra offered the second of three concerts under the baton of Rafael Frühbeck de Burgos, the 80-year-old Spanish conductor whose specialties include the music of the late Romantic era and the early 20th century. This program of Lalo, Debussy and Ravel displayed all of its performers at the highest possible level. It is also a milestone for Mr. Frühbeck's storied career, as this year marks his 150th appearance with this storied orchestra. 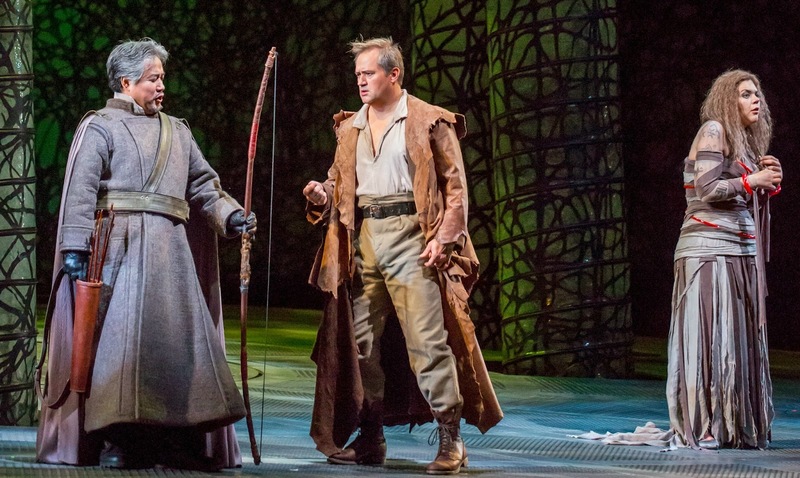 Washington National Opera takes on La Forza del Destino. She wants YOU: Preziosilla (Ketevan Kemoklidze) summons the troops in La Forza del Destino. Photo by Scott Suchman © 2013 Washington National Opera/The Kennedy Center. It is a bold stroke for new Washington National Opera artistic director Francesca Zambello to tackle Giuseppe Verdi's La Forza del Destino in a new production for the composer's bicentennial year. Forza is Verdi's great theatrical experiment, crossing a Spanish revenge tragedy with the sprawling worldview of a Schiller play. The sprawling plot gleefully demands abandonment of Aristotelian unities (and even logic) to tell a story that amounts to an interconnected series of unfortunate events. It is also the opera world's equivalent of Shakespeare's Macbeth. Whispered backstage stories tell of ill fortune--even death--befalling those who dare to sing its three leading roles. Gotham Chamber Opera opens Baden-Baden 1927.
contemplates his actions as Maeve Höglund lies supine. part of Baden-Baden 1927 presented by Gotham Chamber Opera. The Gotham Chamber Opera opened its season Wednesday night with a bold experiment. Baden-Baden 1927, seen Wednesday night at the company's regular performing digs, the Gerald W. Lynch Theater reunites four short operas from the German arts festival which also lends the program its title. This was the first time these works have been performed together onstage in North America. It's just the kind of edgy programming that suits a company trying to ease itself into the seat once occupied by the late New York City Opera. These four works (L'enlèvement d'Europe by Darius Milhaud, Die Prinzessin auf der Erbse by Ernst Toch, Hin und Zurück by Paul Hindemith and the Mahogonny-Songspiel by Kurt Weill) form a snapshot of Europe between the wars, a time of fearless theatrical and musical experimentation before the rise of Naziism labeled these innovations as entartete or "degenerate." Paul Curran's production presents these diminutive operas as exhibits in a debate on the nature of art. Each work was introduced by a member of the cast, putting the operas--or exhibits--in their historical and visual context. Like most exhibits of modern art, some of it worked and some of it didn't. The Met unveils Nico Muhly's Two Boys. 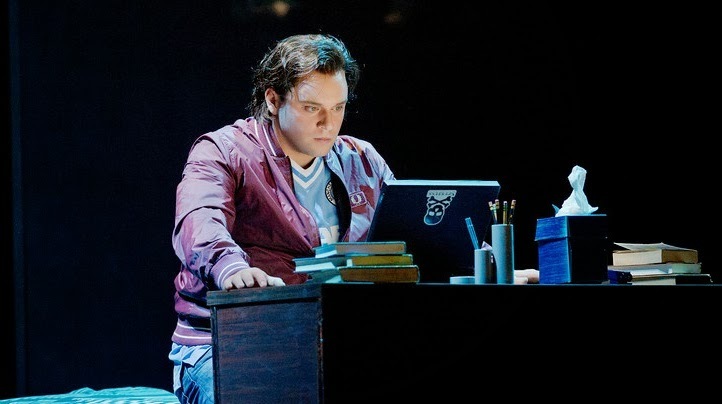 You're sitting too close: Paul Appleby as Brian in Nico Muhly's Two Boys. The Metropolitan Opera leaps squarely into the 21st century with the North American premiere of Two Boys, the company's first commission (and the first opera) from the pen of contemporary American composer Nico Muhly. The opera (which premiered at the English National Opera in 2011) bowed on Monday night at the Metropolitan Opera House. It shines a light into the dark chat rooms of the early Internet, and the ultimately fatal relationship between the cyberspace-obsessed title characters. The London Symphony Orchestra returns to Lincoln Center. 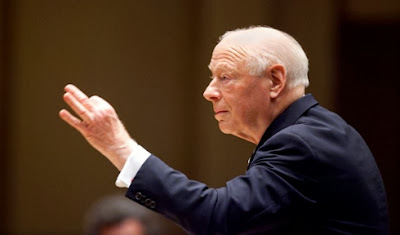 Bernard Haitink returned to Lincoln Center with the London Symphony Orchestra. Photo by Todd Rosenberg, courtesy Lincoln Center for the Performing Arts. The meteoric rise of Dmitri Shostakovich as one of Soviet Russia's most brilliant composers came to a screeching halt in 1936, when the dictator Josef Stalin attended one of his operas, Lady Macbeth of the Mtsensk District. The fall-out from Stalin's displeasure (which included an infamous Pravda editorial) led Shostakovich to quietly withdraw his Fourth Symphony from rehearsals. Locked away in a desk drawer, the work would not be heard until 1961. On Sunday afternoon at Avery Fisher Hall, Bernard Haitink and the London Symphony Orchestra made a good case for the long, difficult Fourth as one of the composer's finest compositional achievements--and its composer's first important statement as a symphonist. (The First is a student piece, while the Second and Third are examples of Party propaganda.) It was fitting that this work was paired with Mozart's Piano Concerto No. 9--that composer's first mature statement in a genre that he would come to master. This concert was the first of this year's Great Performers at Lincoln Center, an annual series of orchestral concerts and chamber works. The 5 Browns Debut at Carnegie Hall. Waiting for their Steinways: The 5 Browns perch on a piano. Image © 2013 The 5 Browns. The piano transcription has always been the unloved middle child of the keyboard repertory. Sometimes, playing an orchestral work can reveal harmonic complexities or make the composer's intent clearer to the ear. Other transcriptions can drain a work of its vitality and reduce orchestral colors to mere dexterity and flash. Both of those extremes were on display on Friday night at Carnegie Hall, which saw the debut of sibling pianists The 5 Browns on the main stage of that historic auditorium. 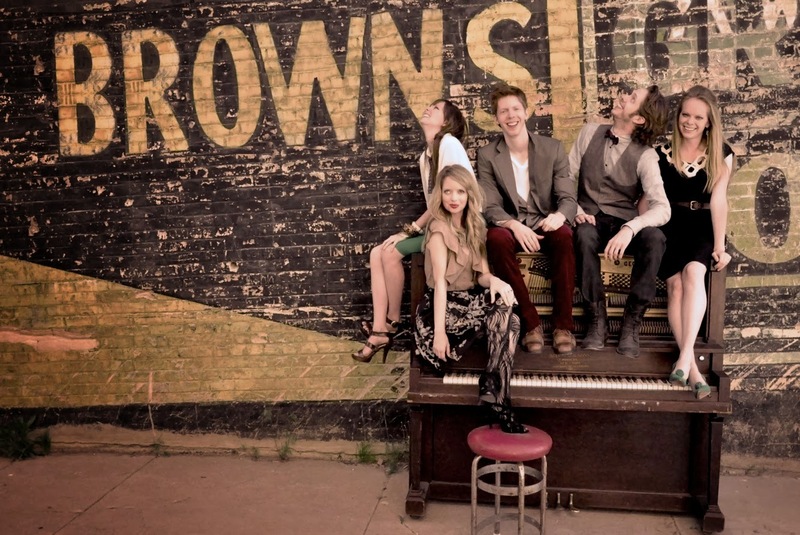 These Utah-raised, Juilliard-educated pianists (Desirae, Deondra, Gregory, Melody and Ryan) offered a program that was almost entirely composed of piano transcriptions, featuring their signature sound of five Steinway concert grands, nosed up against each other in a vast circle of keys, hammers and strings. The New York Philharmonic plays Rachmaninoff and Shostakovich. 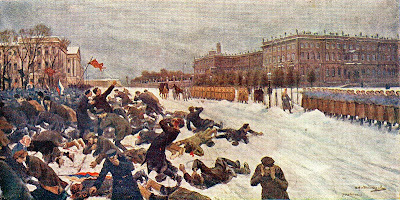 The Bloody Sunday Massacre by Ivan Vladimirov. The month of October in New York has been a bit of a mini-celebration of the works of Dmitri Shostakovich. No fewer than five of the composer's 15 symphonies are appearing on concert programs this month, and his early opera The Nose continues to run at the Metropolitan Opera. This week, the New York Philharmonic contributed to this accidental festival, performing the composer's Eleventh Symphony under the baton of Semyon Bychkov.